Sixty (60 !!! 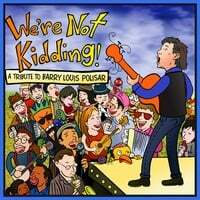 )songs written by Barry Louis Polisar are featured by over 45 different cover bands and artists on this Tribute Album. 19. Hey Jack, What's in the Sack? 22. He Eats Asparagus, Why Can't You Be That Way? 24. What if a Zebra Had Spots? 48. I Looked Into the Mirror, What Dd the Mirror Say? You probably know Barry's song "All I Want is You" from the JUNO film and soundtrack. Barry's song was featured in the opening credits of the movie and is the first song on the soundtrack album which won a Grammy award and has sold over a million copies throughout the word. What you may not know is that Barry wrote and recorded that song in 1977 and has written over one hundred songs over the last three decades. This new 2-disc set features artists from around the world covering Barry's songs. Sixty songs have been compiled by Aaron Cohen of The Radioactive Chicken Heads and re-imagined and performed by musicians in genres as diverse as hip-hop, folk, jazz, klezmer and rock. The album includes all of Barry's classic songs as well as three different covers of "All I Want is You" from JUNO -- including one sung entirely in French by a singer in Brittany. No! No! Not the Nose! There are few genres more earnest than children's music, but thankfully, Polisar finds room for self-deprecation. A must for Polisar fans. This 60-song, 2-disc homage is a wide-ranging tribute of fun classics from the Polisar canon. Deliciously subversive musical humor. Hand this to a fan of alternative rock without mentioning Polisar's kids' song roots, and they'll never know the difference. While the attention given to children's music typically focuses on the newer artists, I think it is important to remember some of the pioneers of this genre. And no one represents a "founding father" of the genre better than Barry Louis Polisar. This album is truly a delight. This 60-song, two-disc tribute is an amazing collection of brilliant talent performing songs from one of the best songwriters around. A spectacular collection of talent from across the U.S. and as far away as Greece. A brilliant collection that will bring hours of entertainment for years to come. Polisar has made a career of writing smart, engaging music and books for children. "We're Not Kidding" is a rich trove of songs that are good natured, subtle, sometimes goofy and often humorous. Given the sheer amount of material here, it's impressive how strong most of it is, largely because Polisar presupposes that kids are intelligent.